College students across the U.S. are at risk of being taken advantage of by banks that pay colleges to market checking accounts directly to students. These campus debit card accounts can come with high and unexpected fees that put college students, many of whom are managing their own finances for the first time, at risk. Campus debit cards are often used to disburse financial aid refunds when students have funds left over after paying tuition and fees. While students always have the option to receive these refunds in their own pre-existing checking accounts, some banks partner with schools to offer students new checking accounts to receive these funds. Under some agreements, banks are permitted to market their campus debit cards aggressively to the entire student body. Campus debit cards offered by banks and financial firms can either be in the form of student IDs with built-in banking functions or separate, freestanding cards. 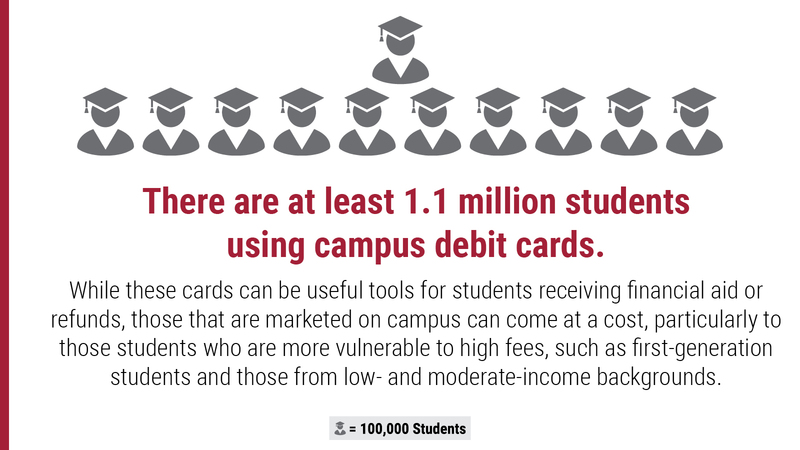 There are at least 1.1 million students using campus debit cards, and while these cards can be useful tools for students receiving financial aid or refunds, those that are marketed on campus can come at a cost, particularly to those students who are more vulnerable to high fees, such as first-generation students and those from low- and moderate-income backgrounds. Most students are protected under recent rules established by the Department of Education (ED), but a few banks continue to put students in harm’s way and require more stringent oversight. Despite the hundreds of colleges sponsoring low and fee-free student accounts, campus debit card agreements still cost students across the country millions each year. 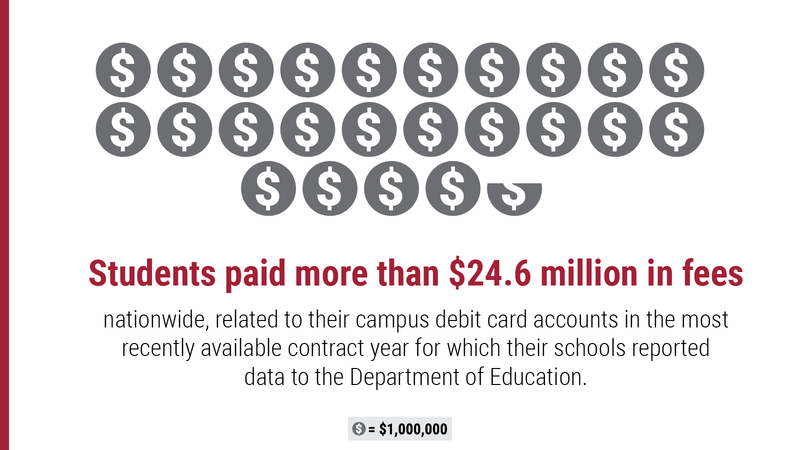 Students nationwide paid more than $24.6 million in fees related to their campus debit card accounts in the most recently available contract year for which their schools reported data to the ED. 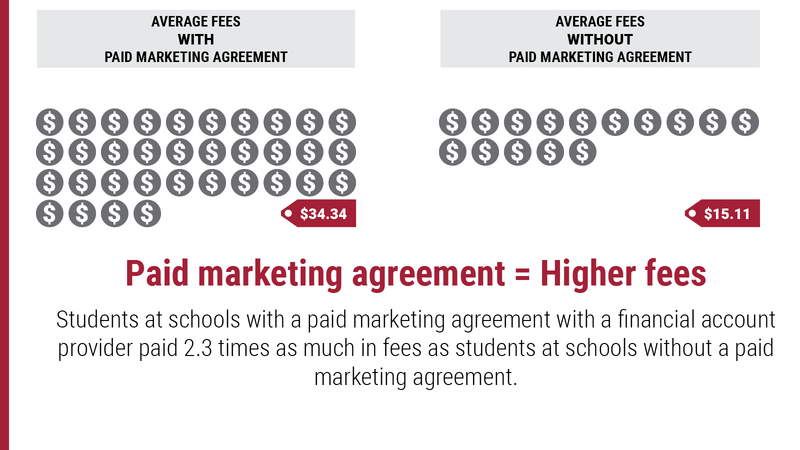 Students at schools with a paid marketing agreement with a financial account provider paid 2.3 times as much in fees as students at schools without a paid marketing agreement. The average annual fee paid by students at schools with paid marketing agreements, and where there were more than 250 student accounts, was $34.34, while the average across schools without such partnerships was $15.11. Of the 331 schools at which at least 250 students held a campus debit card account, 20 had average fees of $45 or more. Of those 20 institutions, 19 partnered with Wells Fargo. Wells Fargo is one of the leading banks offering paid marketing deals that tend to have higher fees for students. 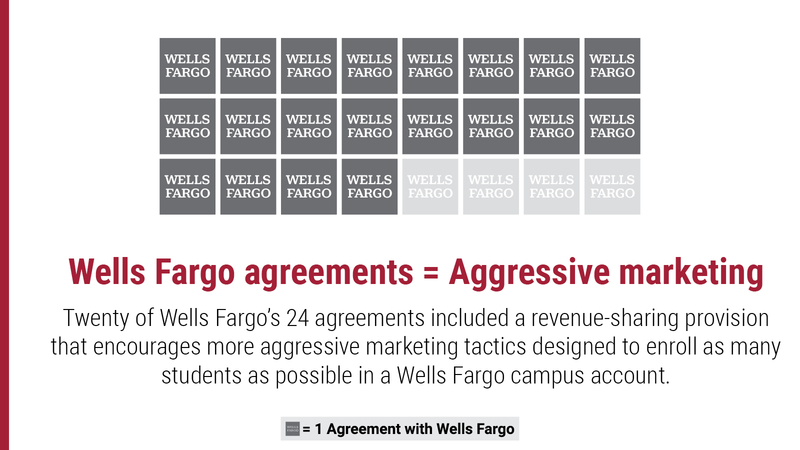 Of the 95 schools with reported paid marketing agreements, 24 partnered with Wells Fargo. Students at schools with Wells Fargo partnerships paid the highest fees – $44.84 on average across all schools. 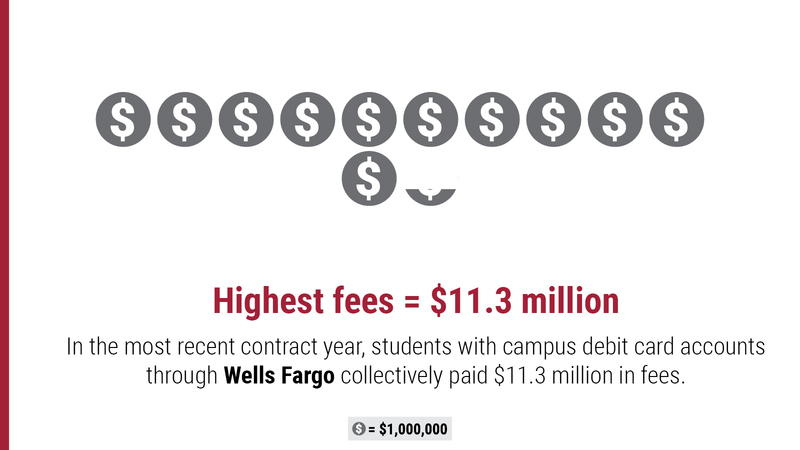 In the most recent contract year, students with campus debit card accounts through Wells Fargo collectively paid $11.3 million in fees. These students represented almost one quarter of all campus debit card accounts, but accounted for close to half of total fees paid by students with these accounts. Students paid a total of more than $1 million in fees at four of the schools with agreements with Wells Fargo. Debit cards connected to campus accounts can look almost identical to a standard student ID card, except that they feature the bank’s logo or name alongside the school’s name and/or mascot, and also have the student’s checking account number. Fees and “push marketing” associated with campus debit cards offered through paid marketing agreements can threaten students’ financial well-being. Campus debit cards offered to students under paid marketing agreements between a bank and school often carry a range of fees, such as out-of-network withdrawal fees, wire transfer fees and overdraft fees that are typically around $35 each. These fees can add up quickly. While hundreds of colleges have agreements that prohibit overdraft fees, most campus accounts offered through colleges that are paid to promote their partner bank’s accounts carried overdraft fees. Paid marketing agreements can lead to “push marketing,” in which schools are paid to promote their financial partner’s campus debit card directly to students through official school emails, acceptance and orientation materials, letters and flyers, and web pages. 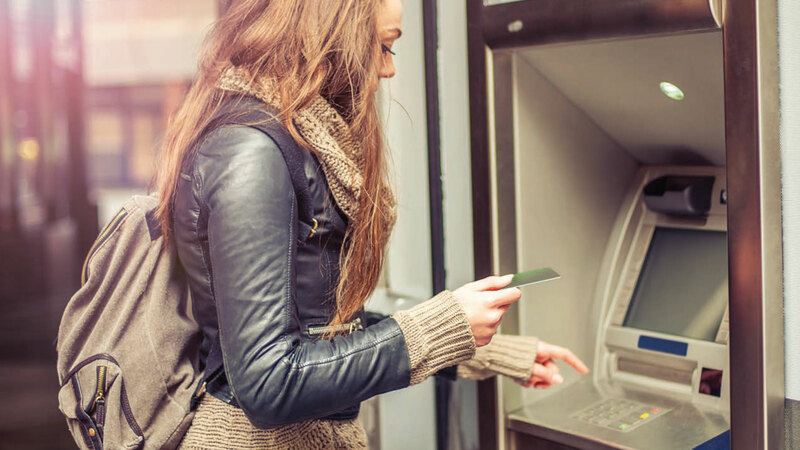 While students always have the option to bank elsewhere, aggressive marketing may give students the false impression that they need to open an account with their school’s preferred bank. 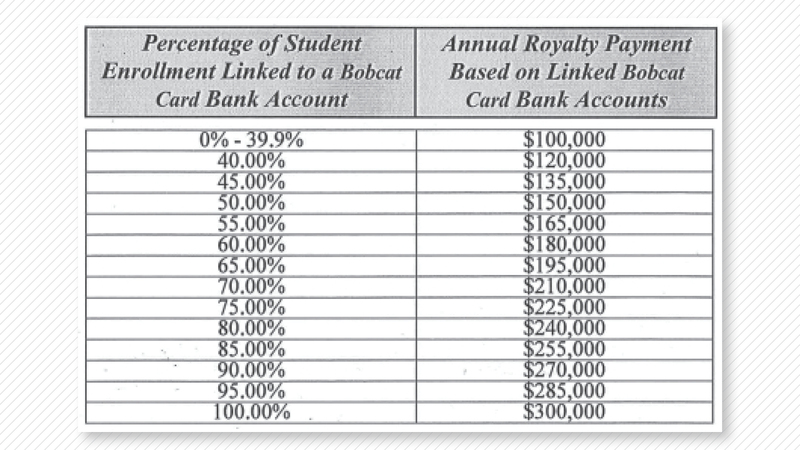 In its agreement with Wells Fargo, Texas State University receives an annual royalty payment based on percent of the student body with a campus debit card, with a max payment of $300,000 if every enrolled student were to open an account. Some campus debit card providers offering paid marketing agreements reached a majority of the student body. 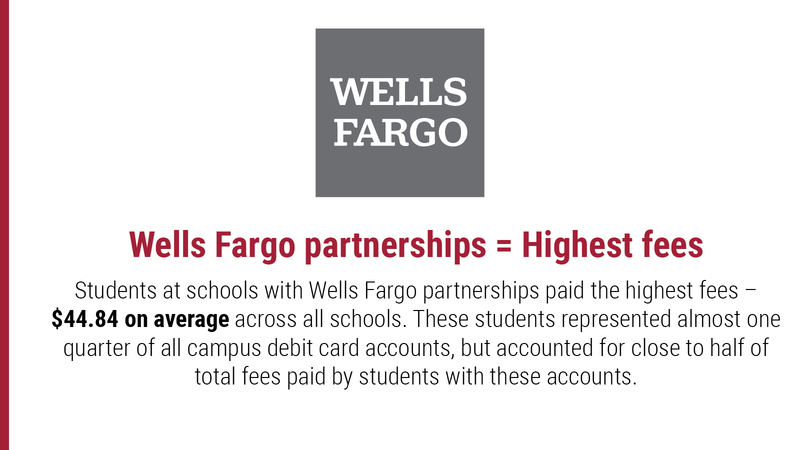 Based on analysis of all identifiable agreements, on average, 41 percent of the students at schools partnering with Wells Fargo had a campus debit card account, compared to 14 percent at schools partnering with PNC Bank. This could indicate a more aggressive marketing effort by the school and its partner bank that is intended to reach the wider student population, beyond just students receiving financial aid refunds. At 10 out of the 95 schools with reported paid marketing agreements, more than 50 percent of the student body held a campus debit card account. Wells Fargo consistently reached a significant portion of the student body. At eight schools with which it partnered, more than 50 percent of students held a linked account. Several banks that offer paid marketing agreements, including Wells Fargo, PNC Bank and U.S. Bank, incentivize schools to maximize the number of campus debit card accounts by providing the schools with a royalty payment based on the number of students or percentage of the student body with an account. Such provisions encourage more aggressive marketing tactics and often lead to a higher percentage of the student body using campus debit cards that could result in high fees. 20 of Wells Fargo’s 24 agreements included a revenue-sharing provision that encourages more aggressive marketing tactics designed to enroll as many students as possible in a Wells Fargo campus account. Who is watching out for students? In the past, the Consumer Financial Protection Bureau (CFPB) was an effective independent watchdog that helped shield consumers from predatory banking practices, but under the leadership of Mick Mulvaney and Kathy Kraniger, its willingness to protect young consumers is in question. 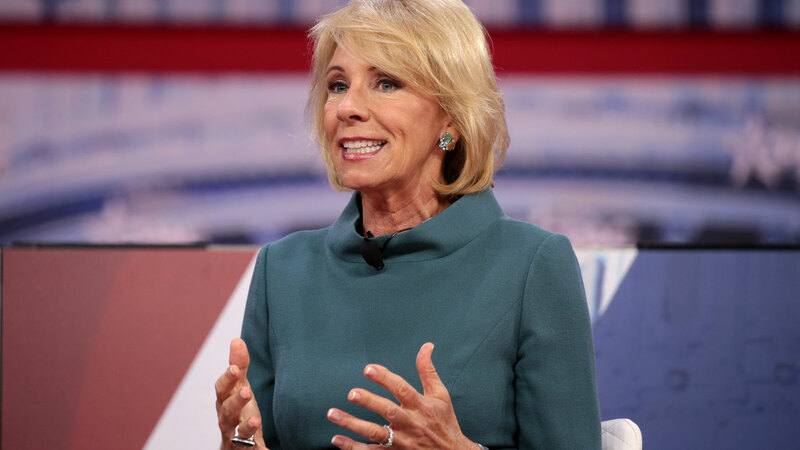 Further, under the direction of Secretary Betsy DeVos, the Department of Education, which is ultimately responsible for enforcing regulations on these campus banking relationships, has ignored CFPB analysis showing that there are problems in the campus banking marketplace, and has failed to provide diligent and consistent oversight to schools reporting the details of their cash management contracts. In order to protect students, existing regulations need to be enforced and stronger, more comprehensive regulations need to be put in place. Banks and financial firms should be prevented from charging exorbitant fees and offering revenue sharing agreements that facilitate “push marketing” on college campuses. Furthermore, because of the clear and persistent problems and high average fees associated with Wells Fargo’s agreements, the Department of Education should consider launching an investigation into Wells Fargo to determine if its accounts are truly in students’ best interests. We're calling on Education Secretary Betsy DeVos to investigate these debit card relationships between banks and schools and hold banks accountable if they're in violation of these rules.